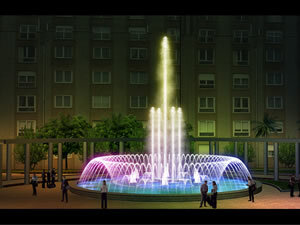 The indoor fountain can be both program-controlled and real-time sound-controlled. For entertainment places, the real-time sound-controlled mode is recommended. Along with the beautiful melodies, the water patterns keep changing synchronously with the dancing and singing. It results in the perfect combination of water, sound, light and color. The indoor fountain not only brings nature to customers, but also contributes to air purification. It functions as the popular office accessory. For instance, classis-shaped ones are suitable for rooms where calm and distinguished feelings are expected; high-energy metal ones are designed for places where dynamism is required. Established in 1984, Guangzhou Water Art Fountain Irrigation Garden Co., Ltd is a professional manufacturer of indoor water fountain in China. In addition to indoor water fountain, we still provide customers worldwide with programmed animated fountain, artificial fog fountain (mist fountain), laser fountain, waterfall rockery, sculpture fountain, waterfall feature, digital water curtain, creek water feature, outdoor water fountain, direct jet nozzle, central upright fountain jet, morning glory nozzle, flat nozzle, fog nozzle, fan nozzle, adjustable nozzle, water sphere and hemisphere nozzle, aerated nozzle, spring nozzle, etc. We have built water features for Spring Festival Evening Gala of China, China Art Festival, and many other Chinese literature and art activities. And so far, we have set up long-term cooperation relationship with customers around the world, such as Malaysia, Brunei, Tajikistan, Saudi Arabia, UAE (United Arab Emirates), and many other countries in Central Asia and Southeast Asia. If you're interested in our indoor water fountain, please contact us freely.